There’s online shopping. Then there’s online giving. A new local web platform is looking to combine the two, in a fusion of philanthropy, technology and municipal government. 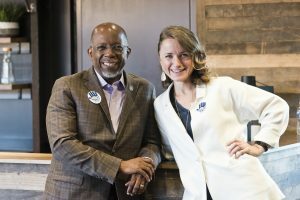 The Giving Wall, a website that connects people living at or below the poverty line with those who are willing to help them fill a need, launches Dec. 3. Founder Becky Crump first conceived of the concept about 1 1/2 years ago. She since has enlisted the city’s Office of Community Wealth Building and a community of do-gooders who regularly attend her Mindful Morning speaker series to help start the online service and facilitate transactions. Examples of help could include someone starting a new job but unable to afford the necessary new work boots or uniform, or someone unable to pay an auto repair or medical bill after just having paid their rent. The Giving Wall operates by connecting what it calls “Supporters,” the people who help, with the “Believers,” those who need a helpful favor. Gordon was involved in the site’s formation. Case workers in the Office of Community Wealth Building vet the needs of the Believers who may qualify for the site. The Office of Community Wealth Building, formed by former Mayor Dwight Jones in 2014, serves as a resource offering career counseling and resume feedback for city residents seeking employment. Supporters visit the web page, browse categories of needs and “purchase” a need that they will fill. When selecting a service, Supporters can see personal stories of the people (first names only) they’d be helping. “Stories are a big piece of this. It can’t just be transactional,” Crump said. For needs involving physical items, The Giving Wall handles the purchase and determines how the Believer will obtain the item — pick it up at the Office of Community Wealth Building, mailed or hand-delivered. Supporters also can make a one-off monetary donation of any amount to a fund The Giving Wall maintains for more urgent needs and their shipping fees. Once the transactions are underway, the Enrichmond Foundation, a local nonprofit that connects to other nonprofits in the area, handles the money. Crump said the foundation’s involvement enables Giving Wall supporters’ “purchases” to be tax-deductible. The Giving Wall derives no revenue from the process, Crump said. Crump pondered starting The Giving Wall for some time before she connected with Gordon after he spoke at one of her Mindful Mornings events. He said clients in the Office of Community Wealth Building are connected with case workers as they move towards economic stability. Gordon said it was all too common for clients to have needs that existing government or nonprofit programming couldn’t meet. “It’s very person-centric, not program-centric,” Gordon said of The Giving Wall. Volunteers have worked with Crump and Gordon for six months to develop the platform, culminating in the holiday-season launch. In the coming weeks, volunteers will help roll out a social media campaign. In anticipation of the site’s launch, Crump coordinated with local businesses, a prominent Richmond muralist and volunteers to paint murals that tell crowdsourced stories of people helping each other in need. 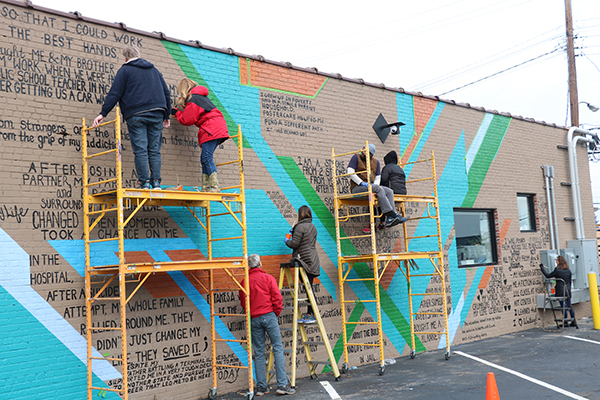 Crump reached out to local muralist Hamilton Glass about participating in communal art projects, the idea being that the act of transforming physical walls can connect community members through shared experiences of giving or receiving help. In mid-November, Glass helped volunteers paint the collected stories at three Richmond locations: Blue Sky Fund, a youth development nonprofit at 2900 Q St.; Soul n’ Vinegar, a Church Hill restaurant at 2832 R St.; and Perch, a Scott’s Addition restaurant at 2918 W. Broad St.
Crump and Gordon gathered anonymous anecdotes from the people they knew through their connections with Mindful Mornings and the Office of Community Wealth Building. “I was sitting down on my luck by the road in off weather. Someone drove by, saw me and bought me a blanket,” reads one story on the side of Perch. Another reflects on a grandfather purchasing a used car for a family that owned no vehicles. Roughly 100 participants helped Glass paint the murals. Crump is willing to consider expansion possibilities. Her speaker series, Mindful Mornings, is in 15 U.S. cities, and depending on how much the site helps in the Richmond community, it’s possible to make it more widespread. Crump said The Giving Wall will be in beta mode for the first few months after launch. “If it’s helpful, we will iterate as needed here, and look to expand into other markets, potentially following those wherein a Mindful Mornings exists and has done good work rallying a supporter base,” Crump said. 1 Comment on "New local startup lets users ‘shop’ for good deeds"
This is just fantastic! Thank you, Becky and Reggie, for the hard work – RVA is such a giving community, I have no doubt it will be a huge success!